A new shopping experience on desktop, tablet and mobile makes it easier than ever to browse and hone in on items you want to buy, whether it’s a camera, a ski jacket or an ice cream maker. Click on a product to preview details like sizes, colors and description, and find out if it’s available at a nearby local store. If you see an item that’s almost perfect but not quite, click to view “visually similar” items. Shortlists help you keep track of products that catch your eye, compare them at a glance, and share ideas with friends and family. Your shortlist now also stays with you at the top of each page while you browse Google Shopping, so you can keep track of items as you go. Sometimes it’s hard to imagine what an item actually looks like from the online picture. 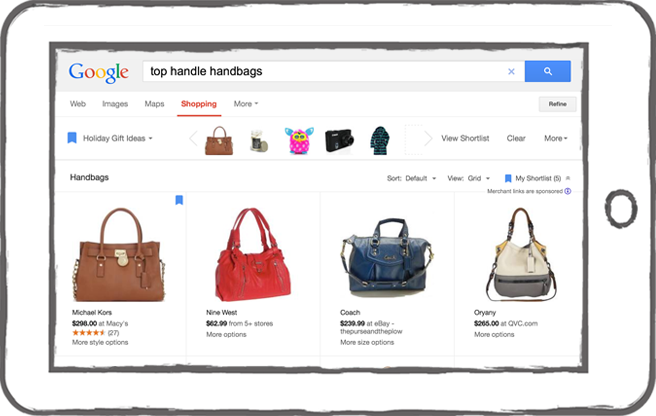 Now, for many items on Google Shopping, you can see a 360° view of the products. These interactive images bring you the in-store feeling of holding and touching a product. Once you’ve got something for everyone on your shopping list, we encourage you to buy something for yourself. You’ve earned it. Thanksgiving is just a few days away, and if you’re like us, you still have loads of stuff to buy on your expanding holiday gift list. If you can’t imagine braving the crowds to get everything picked and purchased, don’t worry: our elves have made some improvements to Google Shopping in time for the holidays.